On a chilly January 30, 1969, afternoon, the Beatles, who played their first concerts at The Cavern’s lunchtime shows and last concert on August 29th, 1966, at San Francisco’s Candlestick Park, stepped onto the roof of their London headquarters at 3 Savile Row to shoot the ending for their last film. Bassist Paul McCartney, long a proponent for keeping music live, was the first to hit the roof and kept warm by jumping on the planks to be sure they’d hold the equipment. Drummer Ringo Starr noted his set was “nailed down in the wrong place,” and slipped into his wife Maureen Starkey’s red raincoat. Rhythm guitarist John Lennon fretted his “hands were too cold to play the chords,”and wrapped himself in Yoko Ono’s fur coat. Lead guitarist George Harrison warmed his fingers on cigarettes kept lit by Ken Mansfield, who was then the U.S. manager of Apple Records. He can be seen wearing a white coat in the film Let It Be. Mansfield remembers it all, with great personal detail in his book The Roof: The Beatles’ Final Concert, which comes out on November 13th. 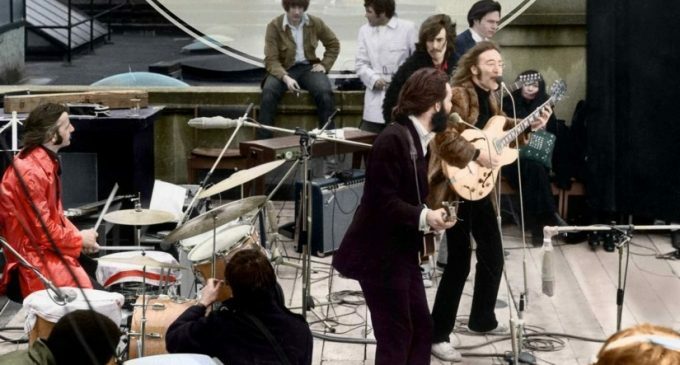 It is almost the 50th anniversary of the Beatles’ final concert. Shot shortly after The Jefferson Airplane performed their own rooftop show in Manhattan, the biggest band in the world were loud enough to catch the attention of the Bobbies at the West End Central Police Station. Their headquarters was only down the block at 27 Savile Row, but they took their time telling the Fab Four to turn it down. They let the band play for 42 minutes before turning off the guitar amps, pushing the rhythm section to the forefront and giving McCartney a chance to improvise a verse just for them. The book is about more than just the concert. Mansfield was part of Apple’s creative evolution. By Let It Be, Mansfield had become familiar with the “quirky, endearing persona of each Beatle as well as the other players closely tied to members of the band – Yoko, Linda, Billy Preston, aka the ‘fifth Beatle’ etc.,” according to the press statement. “He had experienced almost each member quitting the band ‘for good’ at some point or another. But they always seemed to find their way back to each other. Mansfield went on to become a vice president at MGM Records and the president of Barnaby Records, a CBS label owned by Andy Williams. Ken later set up his own company, Hometown Productions Inc., where he produced famous artists of that era, such as Waylon Jennings, Jessi Colter, Don Ho, David Cassidy, The Imperials, Claudine Longet, Nick Gilder, The Flying Burrito Bros. Ken is the author of six other books, including the top selling The Beatles, The Bible, and Bodega Bay (Broadman and Holman) and The White Book (Thomas Nelson). Other titles include, Between Wyomings (Thomas Nelson), Stumbling on Open Ground (Thomas Nelson), Rock and a Heart Place (Broadstreet), and Philco (Post Hill Press). The Roof: The Beatles’ Final Concert will be available on November 13th, from Post Hill Press/distributed by Simon & Schuster.